Model CD109BN. Nano tourmaline ceramic technology emits natural ions to help eliminate frizz. Infrared energy protects hair's natural luster. Even heat with no damaging hot spots. Powerful ceramic heater. High heat is instantly restored during use. Ultra high heat levels 395 degrees F/202 degrees C. Protective heat shield. Nano tourmaline ceramic: Nano technology combines micro particles of tourmaline ceramic and silver for a unique fusion that emits frizz-reducing natural ions and creates shiny, healthy-looking hair. 30-second instant heat (Unit will not reach stabilized temperature within 30 seconds). Ultra high heat levels 395 degrees F/202 degrees C with LED indicator lights. Uniform heat recovery. 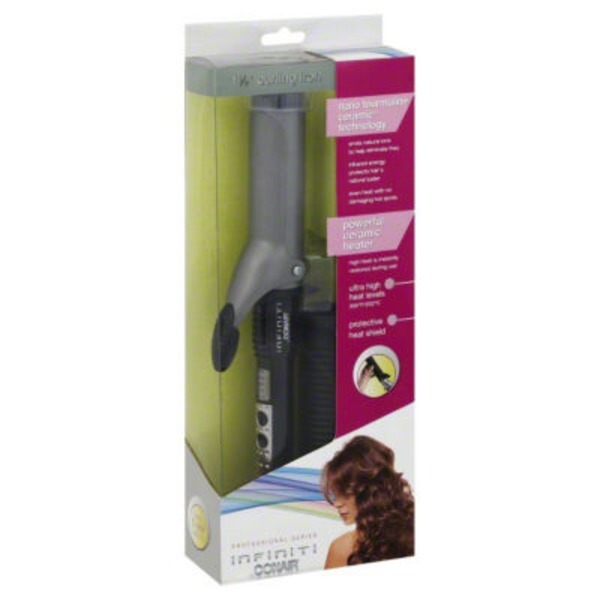 Heat recovery system maintains optimum heat levels for perfect curls. Auto off. Professional swivel line cord. Protective heat shield for safe and easy storage. 1-1/2 inch barrel. This barrel size is great for creating large curls. UL listed. Made in China.